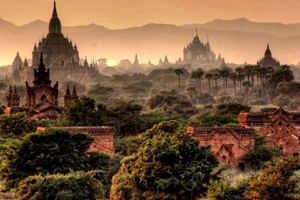 This itinerary has been designed to ensure that you experience the wonderful diversity Myanmar can provide and will take you to most of its major cities. It will use the knowledge of local tour guides who will not only provide excellent levels of service but who also know the hidden gems at the destinations we take you to. The tour will begin in Yangon, which offers a wonderful blend of colonial British and Burmese influences. It is also home to the sacred Buddhist site the Shwedagon Pagoda and Its incredible golden stupa. Here, you’ll encounter several teahouses so you can mingle with friendly locals. 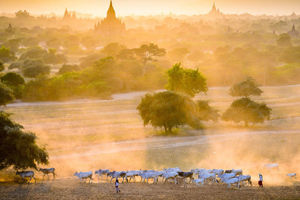 From Yangon, we visit the town of Bagan, which is steeped in spiritual tradition. 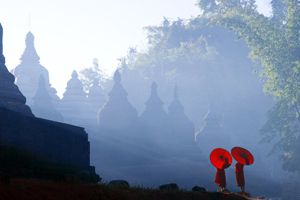 In Bagan, you’ll see beautiful stupas, cave temples and charming heritage sites. The remainder of the tour will include a wonderful journey through Sagaing, Mandalay, and Amarapuravia river cruises and train rides. 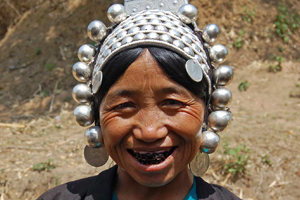 Each location will provide a range of unique opportunities to meet local tribespeople that live along the Irrawaddy River. 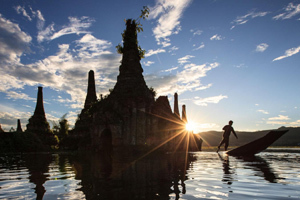 A major highlight of the itinerary will be a trip to Inle Lake, a picturesque location that is also home to a number of different ethnic groups. The tour then ends back in Yangon. On your first day in Myanmar you will arrive in the bustling city of Yangon. On arrival at the airport you’ll be greeted by the local guide in the arrivals area and he will make sure that you arrive at your hotel safe and well. You can then relax in the evening. Day 2 marks our first real day of exploration and adventure. We will provide you with a perfect blend of the ancient and modern and it is also easy to identify British colonial influences in the streets and architecture too. We will see these influences at the historical Post Office building and the Strand Hotel, however will we also observe important Burmese sites such as the Independence Monument and Sule Pagoda which are both located within easy reach of Maha Bandula Garden. Other important stops during the morning will include a brief photo stop to see the home of Aung San Su Kyi and a visit to witness the reclining Buddha that is housed in the Chaukhtatgyi Buddha Temple. In the afternoon, the tour will take you to the 2,000-year-old Shwedagon Pagoda which is also considered to be Myanmar’s most sacred Buddhist site (and the site of a giant golden stupa). However, for those in search of some local immersion, a visit to Bogyoke Market to see and buy local handicrafts will be well received. The tour ends with an exploratory walk around Yangon’s ‘Little India’ and ‘Chinatown’, which are both excellent locations to try myriad culinary delights. 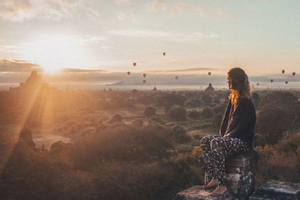 After an early breakfast we then take a flight to the beautiful town of Bagan, which was once the ancient capital city of Myanmar several centuries ago. Bagan is home to a number of the country’s most famous attractions which sit amongst a timeless and mysterious landscape. We start our day by taking you to NyaungOo Market which offers local produce and an excellent opportunity to see local daily life in full flow. After exploring the market, the next stop will then be a visit to the golden temple of Shwezigon Paya which is a place of significant spiritual importance in Myanmar, before we move on to the awe-inspiring cave temple of Wetkyi-In Gubyaukgyi to observe ancient mural paintings. We will also encounter Htilominlo Temple, a site of significant cultural and religious value and a site tourists should certainly not miss. This marks the final stop of the morning before we take a relaxing lunch break. The afternoon then begins in style as you travel to the ‘New Bagan’ area via horse and carriage to experience the local lacquerware workshops. Here you’ll see traditional products, renowned for their quality and craftsmanship, being made andthis will be a unique opportunity to experience a truly authentic Burmese tradition. On the 4th day of our tour we visit Mount Popa after starting the morning with breakfast at the hotel. On the drive to Mount Popa, we will experience freshly made palm juice which can be a sweet, cool drink that is famousin the region. This will also include an encounter with the people that live in the forest who will share with us their authentic techniques and vast knowledge. From here, we then reach our highlight of the day – Mount Popa. Mount Popa is an extinct volcano located about 50kms southeastwards from Bagan and is considered to be of significant religious importance for Buddhists and animists. The views afforded will be breathtaking and it is undoubtedly one of the most beautiful locations in the region. On the way back from the mount, our guide will then take you to a pleasant restaurant to experience some local culinary delights. 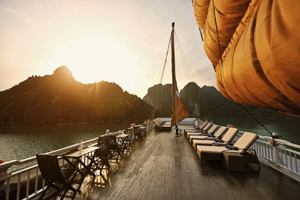 The final reward is then a sunset boat ride down the Arrawaddy River which will perfectly round off a wonderful day of experiences and adventures. After breakfast, on day 5 we bid farewell to beautiful Bagan and catch a flight to the exciting destination of Mandalay. Mandalay will act as a perfect platform for visiting numerous locations in the surrounding region, namely, the towns of Amarapura, Innwa, and Sagaing. Amarapura is famous for its 1.2km long, U Bein Bridge. The bridge is made from teakwood and is widely considered to be both the oldest and the longest of its type in the world. In Amarapura we will also visit the Mahagandayon Monastery, which houses many young Buddhist monks as part of their spiritual education. The next stop on the tour will include a boat-trip to Innwa (also known as Ava) to see the spectacular Bargayar Monastery and Myanmar’s very own ‘leaning tower’ – Nan Myint which will offer panoramic views of the landscape. After a sample of the local cuisine at a nearby restaurant, the day concludes with a visit to Sagaing which is famous for its 30 caves pagoda (U Min Thonze), Son Oo Ponya Shin and Kaung Hmu Daw Pagoda. We return back to Mandalay after Sagaing. After enjoying an early breakfast we embark on a daytrip to Mingun. This will be one of our most exciting journeys as we take a ferry and travel along the beautiful Irrawaddy River. Mingun is famous for a number of reasons and highlights will include visits to Mingun Pahtotawgyi which is a huge unfinished pagoda, the world largest working bell, Mingun Bell, and the spectacular Myatheintan Pagoda. 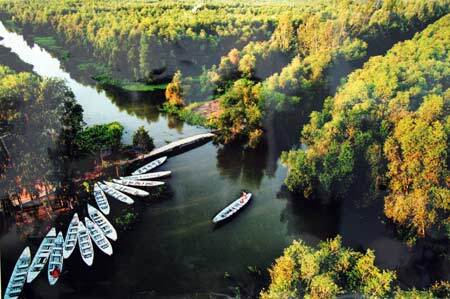 From Mingun we then return to Mandalay, which is home to an exciting array of attractions. In Mandalay, our half day tour will take us to the spectacular Golden Palace Monastery (also called Shwenandaw Monastery), but a range of other unmissable attractions are also located nearby, including Mahamuni Pagoda, Kuthodaw Pagodaknown (which hosts the world’s largest book) and the beautiful Kyauktawgyi Pagoda Paya. Our day ends with a glorious sunset from the lookout at Mandalay Hill. On day 7 of the tour we depart from Mandalay and head for the town of Heho, which is the gateway to the impressive Inle Lake. Inle Lake is the country’s second largest lake and is popular amongst tourists for both its nature and the local indigenous group that lives there – the Inthra people. The Inthra people live along Inle Lake and are famous for their traditions and customs as well as their unique style of rowing (one-legged). Our tour of the lake will also include a visit to the holy site of Phaungdawoo Pagoda and a trip to see the jumping cats found at Nge Phe Kyaung Monastery. The tour concludes with a culturally immersive experience watching local people from the village of Nam Pan make their traditional crafts, including lotus weaving and cigar-making. Day 8 signifies a daytrip to Indein from Inle Lake. Indein is a small but beautiful village located not too far from the lake and is a great way to see and encounter the local people that still live there by traditional means. The morning begins with a trip to experience the 5 days market which includes opportunities to see local tribespeople sell numerous crafts and products. We then will travel to Pa-oh by boat after a traditional Burmese lunch to encounter more locals and explore their unique way of life at firsthand. The tour ends with a walk around Alaung Sitthou which sits adjacent to the magnificent Inle Lake. 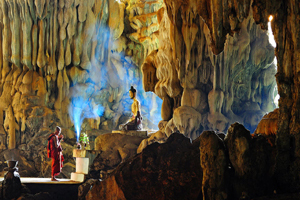 Here, you’ll see a range of important religious temples and stupas that perfectly complement nature and surroundings. On our penultimate day of the itinerary we journey to Yangon via a number of fascinating stops. After our hotel check out and breakfast, we first head to the important religious sites of Kabaraye Pagoda and Pasayana Cave. From here, we then stop at Kyauktawgyi Pagoda (also known as LawkaChantharArbayarLaba Muni) to see the incredible giant marble Buddha as we head further towards Yangon. In Yangon itself, we will engage on short tour that will include an opportunity to take a brief photo ofAung San Su Kyi’s home.We will also visit Kandawgyi Lake and Botahtaung Pagoda, which are both considered to be amongst the city’s finest sights. The tour ends with a stop by the jetty to watch boats sail down the Yangon River before returning to your hotel for your final evening in Myanmar. Unfortunately our magnificent tour ends on day 10 but not before you enjoy a final pleasant breakfast. As we say our goodbyes you will then be provided with a hotel transfer to the airport for your outbound flight.